I'm on the fence about the current format of Tuesday's Science section of the New York Times. It's due to a nostalgic bias: My very first memory of loving newspapers and news reporting took place when I was in fifth grade at a small, private primary school on the Upper West Side. My teacher, Mrs. Hofstedter, required that we follow a section of the New York Times for an entire month. Then we'd "analyze" the day's stories in class. I chose the Science Times back then. I have been tracking medical and science stories ever since. But instead of going into science, I grew to love reporting from this exercise. Only these days, this section can often be confused with the paper's Wednesday's Dining section. That's because under a meta-category callled "Nutrition," the paper has decided to focus on a particular wholesome ingredient, like lentils or eggplant, and delve into which phytochemicals or vitamins one is rich in and to offer up some recipes. I don't think the Science section should carry this kind of coverage. Still, I saw a recent package on winter squash soups that I am excited to try. Butternut and acorn squashes, two examples, are rich in beta-carotene (cancer-fighting) and folate (good for women of child-bearing age). 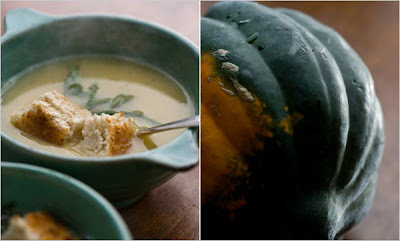 I plan to make their Pureed White Bean and Winter Squash Soup at my next dinner party.